Shortly after my fiance and I moved to Houston, we had to go out of town for a wedding, but we didn't know anyone in Houston that could watch Charlie while we were gone. I researched doggie hotels and luxury boarding but didn't feel comfortable leaving him at any of those places. (Most looked like doggie jails.) 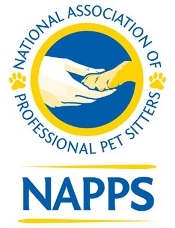 Before I decided to just buy Charlie a plane ticket and take him with us, I researched pet sitters. After reading reviews, I called Lucy Goo, and spoke with Nicole, and explained I was leaving to go out of town in a few days. Even though it was such short notice, Nicole made time to come over to my house the following day. She came over for about an hour and mingled with Charlie and me in order to familiarize herself with him, his home, and his routines. The moment we met Nicole I knew she was Charlie's pet sitter soul mate! Nicole has a true passion and love for what she does. While we were out of town she sent us texts and pictures of Charlie daily. We felt completely at ease knowing Nicole was taking care of our baby! I would recommend her to anyone. Her services cost about the same as it would have for us to put him in a luxury boarding facility for a week. BUT, with Lucy Goo, Charlie was able to stay in the comfort of his own home and have human contact and playtime. We've lived in Houston for about a year now and know plenty of people that could watch Charlie if needed. However, we will use Nicole and Lucy Goo instead! I felt so safe knowing Nicole was taking care of Charlie! I will only use her and Lucy Goo in the future. Nicole and her team have made it easy for me to travel without worrying about Bandit. They truly love animals and send regular updates to let you know all is well. Truly recommend! We have had the pleasure of using Lucy Goo for about a year now. They are wonderful with our dog and always leave cute notes describing the visit! Chloe is always so excited for her walks! Nicole came to my rescue in short notice when I unexpectedly got called back to work. Now i have peace of mind knowing that my girls are being lovingly tended to while I'm gone. Love the report cards! Sophie and Tiki love Lucy Goo! I've used several pet sitters in the past but have never been more satisfied than with the service provided by Lucy Goo Pet Sitting. They are thorough and reliable while also providing TLC for my pets. So glad I found them! Scooter and Tommy have fallen in love with Nicole...I'm starting to think that they look forward to when we leave town! "From the cats: Since we first met Nicole when she came home to interview with our mom, we loved her. We have been enjoying every visit since then. We love to play with her, everyone at Lucy Goo gives us so many good times and care for us! They play and let our parents know we are okay and give them peace of mind. We are in the best hands with Lucy Goo, and will keep seeing them! Purrr! Lucy Goo service has been excellent for us when we've been away. Nicole leaves little notes and updates us by email and phone. Would recommend every time! Lucy Goo Pet Sitting is the BEST! I trust them completely to care for my two cats when I'm away. I am new to Houston and since I don't know very many people, used a pet sitter for the first time with Lucy Goo. I love Lucy Goo! I don't regularly need Lucy Goo's services, but when I am out of town or have an emergency, I have always been able to depend on them. It gives me great peace of mind to know that my dog is well cared for and played with when I can't be home to do it myself! Our spoiled kitty doesn't like anyone other than his 'people', but he loves Nicole! He knows she will bring him special treats and takes the time to play with him. We are fans of Nicole! Nicole and her team are wonderful with our dog, Bailey. Bailey is sometimes not excited about meeting new people but she took to Nicole very well! I wish I knew about Lucy Goo a long time ago because Nicole is so passionate and sweet to Bailey. She also sends me updates via text and email when I am away with a report on how Bailey was doing. Nicole is a lifesaver and I would highly recommend her, five stars! Thank you so much for loving my dog! Lovely lady, kind and very nurturing to our 2 pets, Mia and Maddie. Always professional, timely and thorough. We see her in the neighborhood taking care of the other pets in a way we want ours cared for. Our dog (Ollie) and guinea pig (Fox) were so well taken care of! Ollie was truly the happiest and most content he has ever been without us here. We could tell he was given lots of love and care and we felt good knowing that we could just totally relax on our vacation and the pets would be treated well. Our house was also left in great condition. Nicole even picked up our mail and watered the plants! We always recommend Lucy Goo to everyone! If anyone could love our dogs as much as we do, it would be Nicole. I love knowing that when I leave them in her care that they are well taken care of. Nicole has an amazing memory and remembers little details about our dogs even when we haven't used her services in a while. I love he daily journals she writes about the visits when she is taking care of our dogs. Have something you'd like to share? E-mail us, or follow us on Facebook and/or Twitter.